Not every patient needs a restorative overhaul. Sometimes, all we need is a little maintenance. 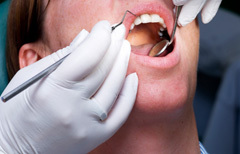 Dr. Axelrad performs procedures that battle and/or prevent tooth decay and poor dental hygiene. Restorative dentistry often goes hand in hand with aesthetic or cosmetic dentistry, as we can protect and beautify your smile simultaneously. Capping teeth with a protective surface that also improves their appearance. Used to replace one or more missing teeth, Bridges span the space where the teeth are missing and are cemented to the natural teeth, or implants, surrounding the empty space. These teeth, called abutments, serve as anchors for the bridge. A replacement tooth, called a pontic, is attached to the crowns that cover the abutments. As with crowns, you have a choice of materials for bridges. We can help you decide which to use, based on the location of the missing tooth (or teeth), its function, aesthetic considerations and cost. Porcelain or ceramic bridges can easily be matched to the colour of your natural teeth. Coating teeth with a durable resin that hardens to improve the colour and appearance of teeth or repairs cracks and chips. Repairing damaged teeth by treating infection in the pulp – the soft tissue of different vessels and nerve fibres inside a tooth. Restoring a tooth’s function and desired look by filling any gaps or damaged tooth structures caused by cavities, trauma and so on. In need of a filling but worried about your smile’s look? Dr. Axelrad offers white fillings, providing a totally natural appearance. We’ll carefully consider and review all options available to you before making any decisions. That includes always counselling patients whenever they must choose between saving or removing any of their teeth. Contact us today to book an appointment. Let us repair your smile. Call Dr. Axelrad’s Dental Office in Brampton for your dental needs at (905) 791-3867 or email us.